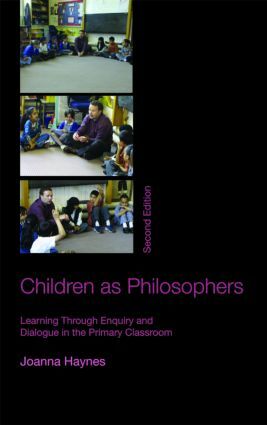 Since the publication of the first edition of Children as Philosophers in 2002 there has been an enormous growth of interest in philosophy with children. This fully revised second edition suggests ways in which you can introduce philosophical enquiry to your Personal, Social and Health Education and Citizenship teaching and across the curriculum. The book demonstrates children’s capacities to engage in sophisticated processes of dialogue and enquiry about a wide range of issues and underlines the importance of listening to children’s ideas. The author discusses the pleasures and challenges for adults in managing discussion and responding to children's claims to knowledge in the philosophical arena. The author also addresses the well-established Philosophy for Children movement, developed in the USA and Australia and links this to the principles of Every Child Matters. wider international debates about learning styles, skills and intelligence. New reports are presented from children, teachers, from the fields of Gifted and Talented and Special Needs Education and from international research carried out over the last five years. What kind of thinking are we teaching? What difference can philosophy make to children’s learning?